I love to cook and get inspired by big cooking project. 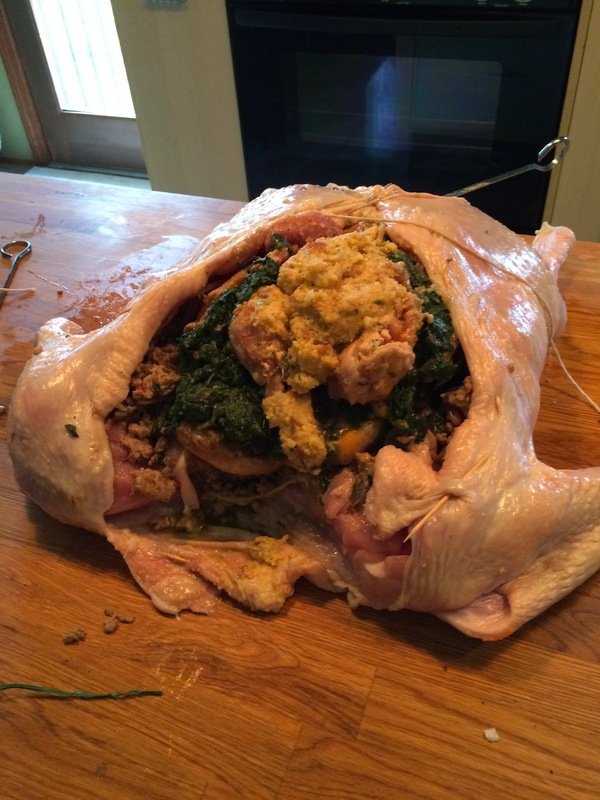 When I heard about turducken, it became an obsession to create one. Turducken is a turkey stuffed with a duck stuffed with a chicken, all boned and a different stuffing between each bird. 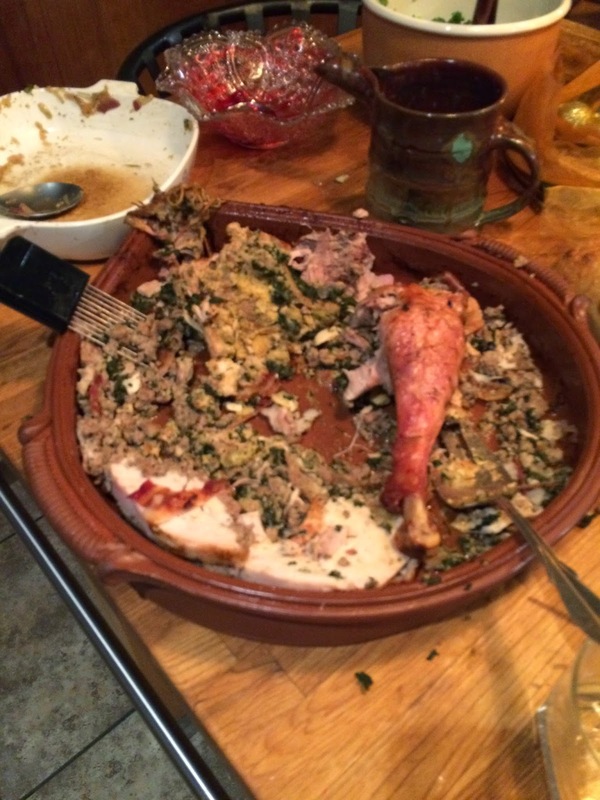 I chose a recipe that had andouille sausage between the turkey and duck, spinach between the duck and chicken and cornbread stuffing in the chicken. 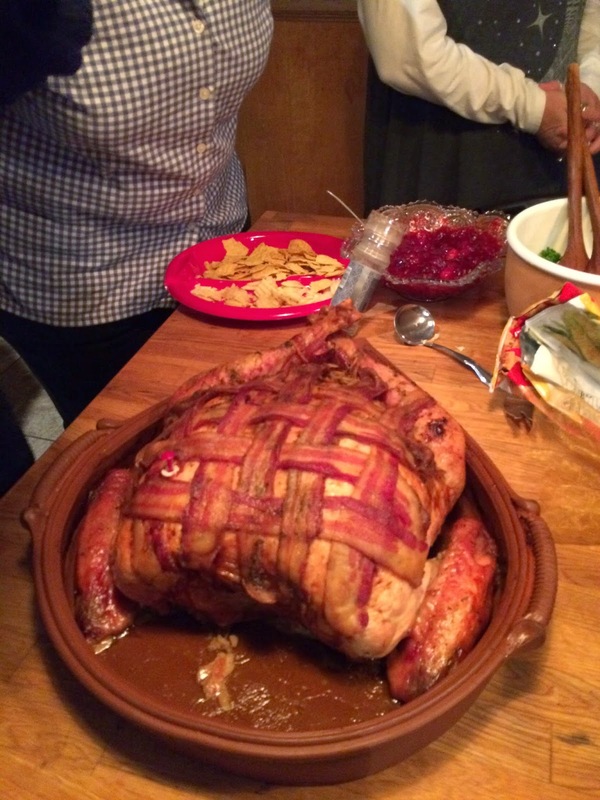 I added a lattice of bacon on top of the turkey. LOTS OF MEAT! I realized my broiler pan wasn't deep enough and I didn't have a roaster, so I got creative and made one. This is a Pampered Chef style pan with no glaze so as I use it it will become seasoned with a lovely patina. Now for sale by special order. Even if you aren't up for turducken, this is a great roaster that is lovely enough to grace the table without taking your meat onto a serving tray. Beckett Pottery Turducken Roaster- 16" x 17" x 2 1/2"- 120. I didn't have a bat that large to throw a round pan and opted for this teardrop shape with a spout at the small end that is great for pouring off excess juice. This held 25 lbs of meat total. The finished bird ready for my 27 guests. Very cool to just cut into 3 birds with no bones to deal with! My crowd had no problem pretty much finishing it off! Great Idea from Random Acts of Art! Being in Florida, she buys my fiesta colors, but here is the piece in Autumn, along with a cracker tray.